A Game of Thrones is a total conversion mod for Crusader Kings II, based on George R. R. Martin's fantasy novel series, A Song of Ice and Fire. Knights, Maesters, our new "Megawar" system for handling civil wars, the Night's Watch, one-on-one duels between characters, several different kinds of magic, and much more. How do I access the Century of Blood and Pre-Doom bookmarks? The extra bookmarks are made as submods (this has made it easier for us to create). To access them you have to select both the main 'A Game of Thrones' AND 'AGOT relevent submod in the launcher. Only the extra bookmarks will be present when enabling the submod, disable the submod to bring back the other bookmarks. Is Essos in the mod? I haven't read all the books/seen all the show. Is it safe for me to play this mod? Don't read the house descriptions on the Game Over screen. Don't go mucking around in the mod's source files, especially the character history files. What DLC does the mod need/use? The mod should run fine no matter which DLC is enabled/disabled. The Sword of Islam: Adds only the ability for the player to have multiple wives as a character of the Valyrian religion. Legacy of Rome: Adds castration and blinding capability as well as a couple of flavour events. It does NOT add retinues. The Republic: Allows the Merchant Republic realms to be played, namely the Free Cities, Meereen, Yunkai, Astapor, Ibben, Asshai and the Guilds of Qarth. These realms will still be active even without the DLC. The Old Gods: Enables the concubine system for Drowned God, Dornish, Pirate, Eastern characters and others (Pre-DLC system will be used if not enabled). Also adds much flavour, including beserkers, adventurers, new rebels and runestones. Raiding is available for drowned god, wildlings, pirates and others even without this DLC. Sons of Abraham: Enables the council of the Most Devout and their election of the High Septon. Also adds many religious flavour events, including various Holy Order events/decisions. Rajas of India: Adds flavour to various far eastern cultures, including tiger hunts, gurus, reincarnation events and other flavour events. Horse Lords: Adds the nomad mechanics for Dothraki/Jogos Nhai (DLC now required to play these), landless adventurer mechanics for Ironborn, the wolf flavour events and land trade routes. The Reaper's Due: Adds improved epimedic and illness mechanics, including hospitals and court physician treatment events. Adds prosperity and depopulation, as well as other flavour events. Jade Dragon: Adds unjust conquest casus belli, chinese portraits/buildings which are used in Yi Ti, and some artifact/chinese flavour adapted for the mod. Holy Fury: Adds Shattered/Random World system, Warrior Lodge societies, Tiered-scar system, Kill List, Forge Bloodline ambition, Coronation decision, Sway and Antagonize decisions and other misc flavour. Roman portraits used in Asshai. Customiser: Fully compatible with the mod. Needed to enable renaming of dragons and artifacts. Why no Game of Thrones music? NOTE: We do not endorse Piracy, if you don't own it and want it: Buy it! What is the 'Old Frames' option in the installer? Paradox changed the style of the character frames in patch 2.4, selecting this option retains the old style of frames from before this. I'm a Wildling and I have no idea what I'm doing. The Wildlings don't respect dynastic ties the way Southerners do. They'll only follow strong leaders. The Wildlings receive a free Invasion CB on all their neighbors, and they receive significant military bonuses from having high prestige, but these bonuses come at two dangerous costs. First, Wildling provinces are ruled only at the Wildlings' pleasure. Anger the people too much, and you may find a revolt on your hands. Second, don't expect any higher-tier titles you create to outlast you - Wildling higher lordships and kingdoms can dissolve on their rulers' deaths. As a Wildling, you'll find that power is easy to gain, and much more difficult to keep. I am a French speaker, why are the dynasty names in English? For french users: si vous voulez jouer avec les dynasties traduites, rendez vous dans Mes Documents/Paradox/mod/A Game of Thrones/Traduction dynastie/FAQ où vous trouverez la démarche à suivre pour jouer avec les noms des Maisons en français. I'm making a CK2 mod and would like to use your Duel Engine or any other part of the mod, or I'd like to use your Duel Engine as a standalone mod. Altering or using content from the main AGOT mod for use in a submod or another vanilla mod is fine, permission is granted to all who wish to do so. If using content in a vanilla mod please credit "the AGOT team"
We've also released a generic, de-Westerosified version of the Duel Engine as a standalone mod here. My character has like 25 martial, why is he losing to guys with really low martial in duels? Martial ability, being a command rating, has no effect on duel outcomes. Traits are what determines this. The combat traits are the most important, whilst others like strong, weak and valyrian swords also contribute. Are there supposed to be random silent sisters showing up in the Kingsguard/Nightswatch's court? 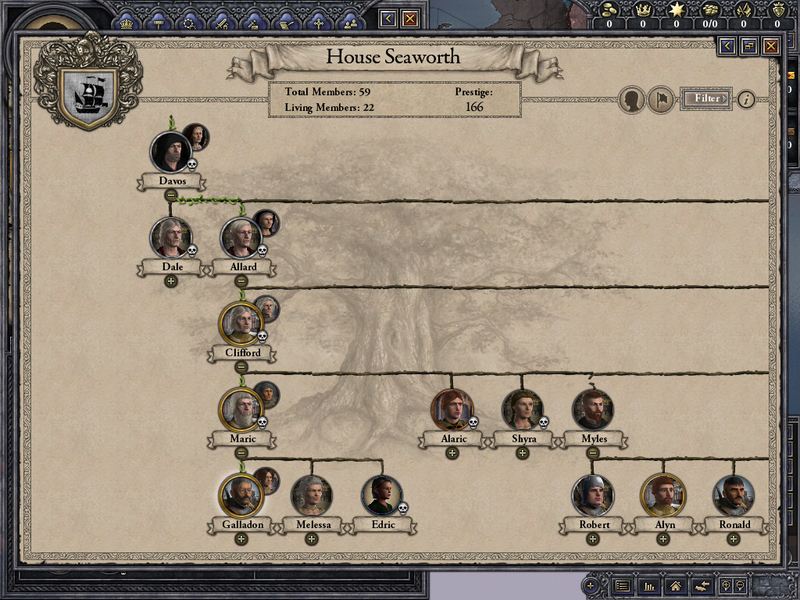 Why are all High Septons called High Septon I? A new High Septon extends the practice of septons giving up their family names by renouncing any kind of individual name. This is due to the belief that the individual becoming High Septon is no longer a man but an avatar of the gods. Fabricating claims isn't working/happening too often, what have you done to it? The chances of fabricating a claim have not been altered from vanilla, so having loads of claims or none at all in a certain period of time can happen. BOOK/SEASON 2 SPOILERS: Why can't I play as Renly in A Clash of Kings? We decided that moving the start of the scenario to after Renly's death provided better balance. The old setup with Renly alive and the original events is still possible to play by manually moving the start date to 11th Feb 8299. Why are my wars ending inconclusively sometimes? Flicking through different dates and characters on the character selection screen may cause wars to end inconclusively instantly when the game starts. This is a vanilla bug, if it does happen simply restart without flicking. How do I colonise a ruin? Ruined provinces are now colonised via a province decison, which is accessed by right clicking on the shield/coat of arms of the province. Note that 100 % of the money goes to the composer, not to the mod team. This is relatively small update making the mod compatible with CK2 3.1. There are however several new additions, and many more history and map updates. Ever since Fire and Blood was released we have been working on getting the history database up to speed, and it is now ready for release! The quantity of history changes is quite large, including many other non-Fire and Blood related improvements, and there are many more to come in upcoming updates. - Maesters are less bloodthirsty! Our Holy Fury update is finally here! This has been in the works for many months, and includes many new features which utilise the modding potential from Holy Fury. No Fire and Blood info is included in this update, this will be included in the next update. - Take a salt husband! Yet more Pre-Doom improvements accompany this update, as well as many new addiitons and bug fixes. Also check out the many map changes, including a revamped beyond the Wall. 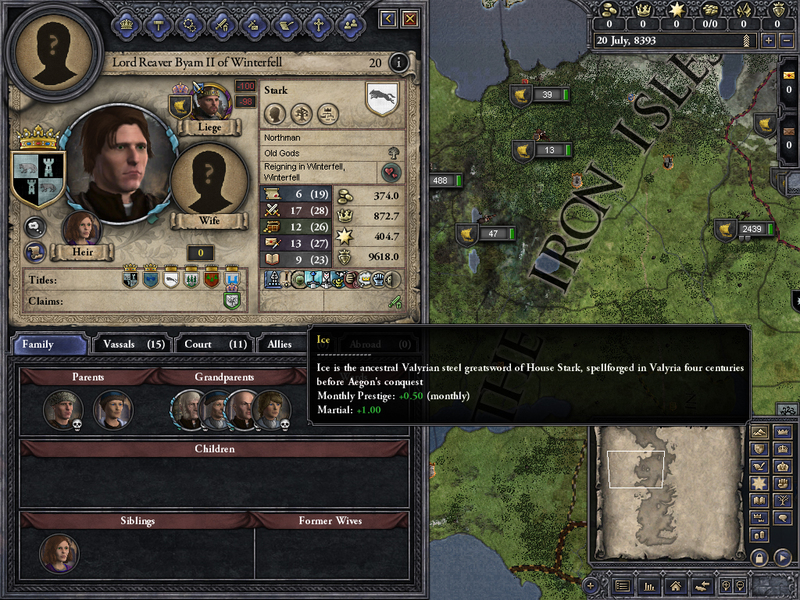 - Valyrian steel swords and dragon eggs now use the artifact system. Here is a modest update to tide us over before the next vanilla DLC and 2.8 patch arrive. It contains numerous useful additions and fixes, including new artifacts, balance changes and events. - More tourney flavour- including gambling! We are pleased to release a new scenario! Play in the 'Century of Blood', set just after the Doom of the Valyria and perhaps try and reclaim the Freehold. This new bookmark is accessible via an include submod. There are also numerous other tweaks, fixes and additions. We have been working smoothly on getting the mod to speed for the latest patch and the 'Monks and Mystics' DLC, and are happy to release this update. We have started work on integrating artefacts and societies in the mod, but this work is still ongoing so hopefully this is just a start. We also have a new bookmark lovingly handcrafted by blackninja, that is set in the book 'A Game of Thrones', the titular book of the mod itself! - Added a Noble Oligarchy government type, currently used in Qarth and Ibben. Now paradox have released the 2.6.3 patch, we thought it would be a good idea to make a public update ourselves before the next major patch and DLC arrives. Our public release for 2.6.2 and The Reapers DLC has arrived. We hope you enjoy the many changes, improvements and fixes that have been made! So here is an update including all the nice book lore! This all mainly important fixes for bugs in 1.1, plus some minor tweaks and additions. With season 6 of the Game of Thrones Tv show coming up we've been thinking hard about what to prioritise. Due to the popularity of the show, we've decided using the show as our primary source of canon is the way forward. So here it is! Robb is now married to Talisa, Sansa to Ramsay Bolton, plus many other alterations! This is probably one of our largest updates ever, and it includes many additions and fixes. 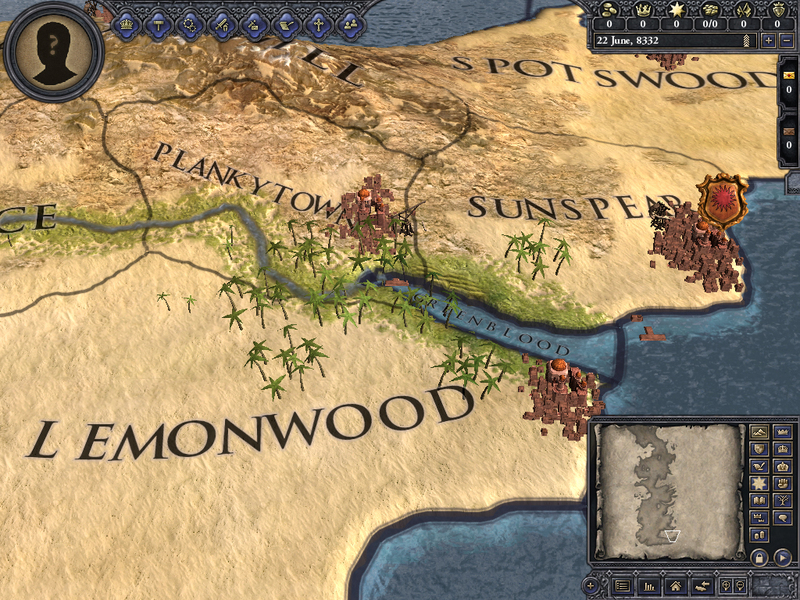 The mod now makes full use of features from Conclave and Horse Lords DLCs, with a new education and council system, as well as Dothraki and Jogos Nhai now using the nomad mechanics. Plus much more! - Seduce your wife and strangle your enemies! Way of Life and foci have been adapted for the mod in this version, any of the vanilla foci can now be selected and used by all rulers. Other additions include a new Great Council event chain, and a mega war rework which allows custom empries to be created. Some effort has also gone into fixing bugs, so hopefully stability should be improved. This update takes advantage of the new modding capabilities introduced by the vanilla beta patches, the highlight of which is the new moddable diplomatic actions. Many other fixes and additions, including from the World of Ice and Fire, are ongoing. - All personal interaction and slave actions are now in the diplomatic menu. Many other decisions also moved to diplomatic menu. This update is the first step in intregrating all the new information from The World of Ice Fire. Many database additions/updates have been added, plus lots of tweaks, balances and events. Also many changes have been adapted from the latest vanilla patch. In this update The Night's watch and the White Walkers have received some love, with many improvements, fixes and additions being added which hopefully make the area more playable. The details are listed below. As usual, many fixes, tweaks and new flavour have also been added. This brings the mod up to date with the latest 2.1.6 vanilla patch, and includes tweaks, fixes and numerous small additions. - The AI in The North is allowed boats again! - Overhauled tourneys. Characters now match up in duel-like jousts. - Adjusted claimant adventures. Adventurers now usually require gold to accumalate an army, the size of which increases the wealthier they are. They can also ask nearby rulers for funding. - Rebalanced the Conquest of Dorne scenario. The lords of Dorne are now in revolt against the Tyrells only, giving them a chance of winning. This update mainly brings the mod up to date with the latest patch and DLC, utilising some of the new features added. Dragons and Dothraki are the highlights of this update. The Dothraki Sea is no longer inactive, Dothraki Khals now being fully playable. They work quite differently from other characters, so reading the manual entry on them is advised! Also the CTD problems should be mostyl fixed now. - If you are wondering about the question mark flags everywhere, there are currently no flags for many areas. Another patch from Paradox means another update from us, again this is a small one that deals with 1.102. This release is a small update that mainly makes the mod compatible with CK2 patch 1.101, including some bug fixes. -Wildlings can go now go raiding and gain defensive bonuses. -Added a dynamic dynasty rivalry system. Enemy dynasties can now use the vengeance CB against eachother, which now also enforces all claims . -Added some canon rivalries, including Frey-Stark rivalry from AFFC. Nothing too major in this release, but there are plenty of additions to try before The Old Gods, as well as the usual numerous fixes. - Finally added mechanics to improve base value buildings on your castle holdings. Since we noticed some of you didn't like the Eastern Continent as much as we hoped, we removed it and decided to focus on Westeros again for the moment. And so, here's the new version! The first thing you'll notice is that armies can move again, but the most perceptive amongst you will no doubt notice we have two new scenarios: the much requested Blackfyre Rebellion and the spoiler-heavy A Feast for Crows (seriously, don't even think about clicking on it if you haven't read all the books). There are a lot of tweaks and additions, as usual. You'll find, for instance, that you have new options to employ Hedge Knights. We have begun adding sensible buildings at last, so that late game should hopefully be improved, and there has been quite an overhaul in certain parts of the map. In honor of Game of Thrones' return to television yesterday, we're proud to bring you a new release, and with it a feature you've all long awaited and fiercely demanded. 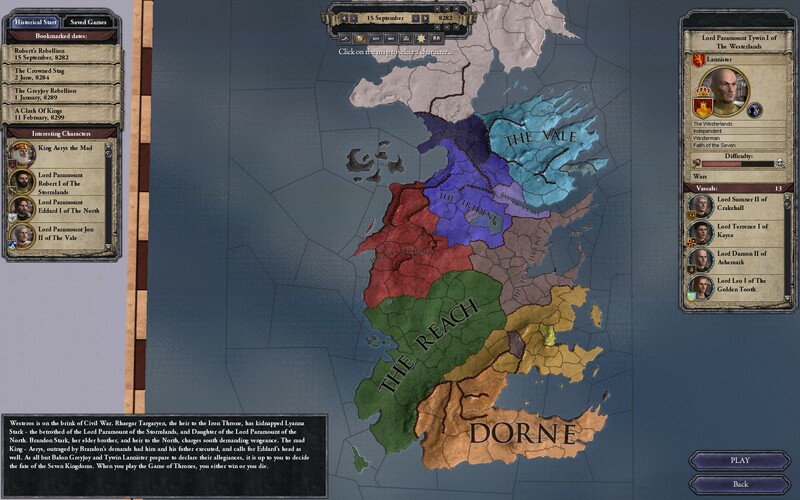 That's right, as of patch 0.4.1, the game of thrones is no longer confined to Westeros! We've worked painstakingly to let you cross the Narrow Sea and experience the wonders of the East, a land of merchant cities, savage horselords, fanatical worshipers of the One True God, and the ruins of an empire long fallen. A simple compatibility update for CK2 v1.091. We simply focused on fixing as many bugs as we could in the short time between this release and the last one. Airborne duels between dragon riders. A new scenario to show them off - the Dance of the Dragons. A second new scenario, the Conquest of Dorne. New Loyalist factions that make civil wars far more balanced, and factions far less of a pain. Several new features surrounding sexual politics, including stillbirths, abortions, and a brand new system for secret bastards. Our very own original soundtrack, courtesy of the extremely talented Aurelien Benharrats. This is primarily a compatibility update, allowing you to play the mod with CK2 1.07, but we've also added three new scenarios from Westeros's ancient history. The Seven Kingdoms allows you to experience an alternate history where Aegon the Conqueror never united Westeros, while War of Conquest allows you to either try to recreate his conquests, or defeat him. Finally, After the Spring is set in 211, in the aftermath of the devastating Blackfyre Rebellion. King Aerys I reigns and the notorious Lord Bloodraven serves as his Hand, while the son of Daemon Blackfyre plots to avenge his father and fulfill his claim to the Iron Throne. Warning: Some scenarios are currently the victim of an extremely strange bug, which causes some lord to be independent if the scenario is loaded immediately after loading any of the new scenarios. The worst occurence of this happens to Dorne and the Reach in the Crowned Stag. If you experience this bug, you can fix it on the game setup screen by selecting Robert's Rebellion, then selecting The Crowned Stag again. This release is focused on bugfixes and tweaks. There are no earth-shattering new features this time, but of course that doesn't mean there aren't plenty of interesting additions. For instance, you might find out people are now much more sneaky when trying to take another people's job. Or some new colorful insights on Ironborn culture (which involve chopping other people's heads off and taking their stuff). Rich characters might have some options to rebuild certain megalomaniac constructions from the past, and you might also notice it's now quite dangerous to lose your main castle in a siege. There's plenty more flavour, too, if you can bear with it! Barring surprises, our next release should happen after 1.07 comes out and will hopefully take advantage of its new features. Everything is finally ready for the Clash of Kings! You can now relive the War of the Five Kings in all its glory and recreate the events from the books, or steer them in a different direction if you prefer. We're pretty confident that this build is one hundred percent not balanced, but we still think it's in a state worthy of release. We'll be especially looking forward to feedback on balancing the Clash of Kings scenario. Our next release will obviously focus at least somewhat on fixing issues reported in this one, but we also have a smorgasbord of planned new features that didn't quite make it into this release. You all still have plenty to look forward to. This is mostly a bugfixing update. There were a few nasty bugs in 0.2, so we decided to fix them instead of waiting for the Clash of Kings to be ready. Apart from that, there have been some interesting new features, some of which you guys had been asking for a long time. Now the mod is compatible with 1.06, but this is far from being the only change in this version. First and foremost, you might notice some new faces north of the Wall... These guys are there to stay, but they aren't completely fixed for now, and you might notice some strange behaviour. This is because we wanted to release the new version as soon as possible to let you guys play after 1.06. For this same reason, please be on the lookout for any bugs that might show up! There have been some attempts to make things more interesting after Robert's Rebellion ends. The realm should be more unstable now, and characters have more options to raise hell. We will keep expanding on this in future versions. In addition to this there have been an immense amount of tweaks, changes and additions, too many to mention here. We have taken some features from other popular mods, expanded on what we already had and added plenty of flavour. A new scenario, the Crowned Stag, allowing you to skip that messy "War of the Usurper" business. This patch is essentially an "upgrade pack" for the existing Robert's Rebellion scenario, but we're aware of the stability problems that crop up afterward (specifically, there being too much of it) and we definitely plan to address those in future releases. For now, though, we think you'll find these new features to provide plenty of entertainment. Balance should have changed a lot. You should now see much faster wars, with do-or-die battles which can actually change the course of the entire war. Attrition should be more manageable too, as long as you try to stick to the roads whenever possible. You'll notice there's far less money around. The overabundance of it in our first release was actually a bug, which should be fixed now. Feel free to tell us whether you think we went too far or if we should decrease income even more.